A while ago I told you about my newest obsession - capsule wardrobes. I shared with you both my kids’ capsule wardrobes for winter, and my own core capsule. Today I want to show you my summer capsule. What makes it different to my core capsule? My core capsule consists of 28 to 34 pieces that can be worn year-round. 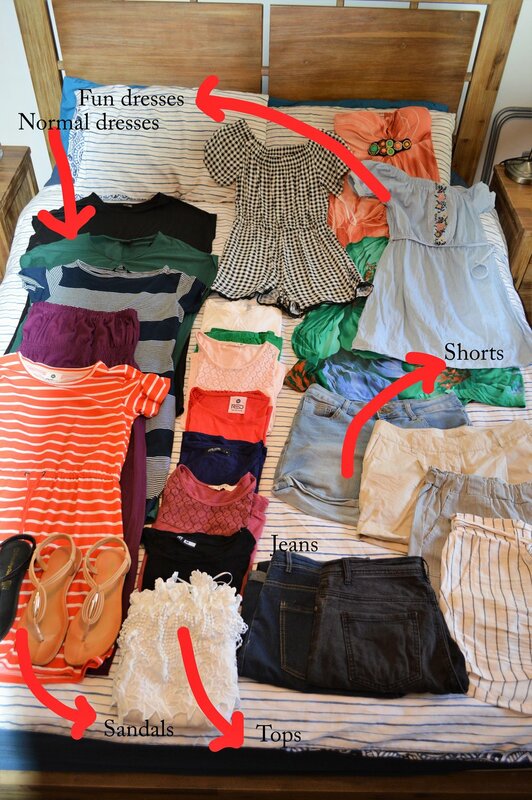 That includes items such as tank tops, jeans, leggings, and dresses that can be worn in summer as well as in winter. It does not include things such as sleepwear, active wear, swimwear or jackets. Your core will be the items that you use as the backbone of your wardrobe, adding to it seasonal items that fits and goes with the overall look and feel of your normal day to day style. The seasonal items’ number ranges from 20 to 30, so together with your core capsule, every season, you will have roughly 70 pieces to choose from. That is a lot of clothes, and more than enough to take you through the whole summer/winter/spring/autumn without really having to repeat an outfit. For both my core and my summer capsule I counted my shoes, which some capsulers (no such word, but you can join me in calling us that) do not do. I have not included my pajamas, gym clothes, swimming costumes or light scarves. If you look at the photos you will also notice I have not included any jackets - we are in the middle of a major heatwave and so all my jackets are packed away. Far far far away. But I will explain everything in the run down. What my core capsule needs is a crisp white collared shirt, a black collared shirt, and a light blouse or two that I can wear to more dressy events. Also, black pants, a little black dress [might have one that can work] and a longer length top that can double as a top over leggings/pants or a dress. Although I have pictured the jeans, they are actually part of my core capsule and thus do not count towards by summer capsule. The reason I included them on the photo is to show you the versatility of the capsule. The tops can be worn with the shorts or with one of my core pieces - jeans or beige pants or maroon pants etc. Most of the dresses can be worn with my sneakers, or with my pumps for a more dressy look or with the sandals. Both pairs of sandals work with almost everything else in the capsule. If I forget about my core capsule, I will still be able to assemble at least 50 different outfits using only the pieces featured above. Simply by changing your shoes or pants, and by wearing different earrings or a light scarf you give yourself a totally different look. The pieces above can take me from work to play simply by changing my shoes, or changing into shorts instead of long pants. And the dresses - I think I will be able to wear a long sleeved shirt under the emerald green and black one, meaning they can be upgraded from summer capsule to core capsule. Makes sense right? Right. If you agree, then download my handy capsule planner and get started! Share your pics and give us some motivation. But mostly, enjoy! Sign up with your email address to receive my handy planner as well as news and info as it breaks. We respect your privacy. promise I will never spam you, sell your info or forget that you are the reason I am doing this. Plus you can unsubscribe anytime you want!